SPRUCE CREEK, FL - The night was dark, only a glimpse of the moon could be seen through the cloudy skies. It was quiet for the most part, that is, until various creatures decided it was time to go out for some fun. Led by the Corpse Bride and Minnie Mouse, follow the Bravo family and friends as they cruise around Spruce Creek Fly-In on Halloween night. The traditional route along Spruce Creek Boulevard and many of the side streets with names as Roscoe Turner Trail, Sky Hawk Court, Cessna Boulevard, Doolittle Court, Mitchell Court, and King Air Court gave a hint that this is not your typical community. The aviation theme is al around. And the characters are anything but your typical suburban airplane-nut families. Despite the current economic depression, there was plenty of candy for the kids and the festive spirits permeated the atmosphere. 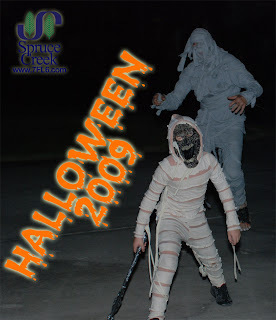 Nothing will stop Halloween in Spruce Creek. Joining the golf cart caravan terrorizing the streets of Spruce Creek there were goblins, witches, wizards, walking dead, and even an awake airline pilot! The Mummy on Slow Flight Drive this year had a partner in fright. Shorter but much scarier, they teamed up on unsuspecting candy prospectors in coordinated assaults and chased them around the neighborhood. A final assault was made on The Downwind Cafe, where Kenny the Proprietor paid his dues, in candy, lest he be the next victim of the Corpse Bride and her partner. See the Images as permanent testament of this 2009 Halloween Night. Que cosa tan cómica. Spruce Creek es indudablemente un paraiso para los pilotos. Nosotros en Argentina no tenemos nada como eso que yo sepa.